We all know the debate between American politicians and environmental scientists: Is there really climate change? Global warming? We’ve also learned that our strained relationship with China has compromised our recycling efforts. Those of us who care deeply about our land, water and air would like to know what we can do to improve the state of our environment. Join Jennifer as she talks about important environmental challenges with Bradley Layton, PhD, PE who is leading multiple solutions-based initiatives. Our population is confused about health and wellness. 75% of the population is overweight and people are ignoring their body mass index, seeing it as a bad means of measurement of health. Re-education needs to be made at a mass scale. What does health and wellness really mean? We’re over complicating it with fad diets and flashy exercise routines. Joe Moore of Barbells, Bolts and Bourbon will share his experience and provide tips for becoming the best you. Simple tips include the five easy health markers that anyone can measure; including: 1) good sleep hygiene (consistently need 6-8 hours), 2) protein consumption 3) hydration 4) good (balanced) stress & 5) movement. Joe Moore is the CEO of Barbells, Bolts and Bourbon and J Moore Sport Performance. Over the last decade Joe has coached everything from Rugby to Dance. Through all of these platforms he has lead hundreds to find a love for fitness and wellness. As an Eagle Scout Joe learned the importance of being prepared for anything. Earning his master’s degree in Sport and Exercise Psychology taught him the meaning of perseverance and being a black belt in Karate and Ju Jitsu helps him practice discipline in everyday life. In his rare moments of down time Joe loves to find a good rock face to climb or trail to hike with his 2 dogs. With the advent of social media, fake news, the inundation of information and the lack of gun safety laws, we are all deeply affected every day by the constant examples of trauma and tragedy imposed by others. In this episode, Jennifer will talk with Jamine Moton, Founder, and CEO of Skylar Security, about multiple perspectives on public safety: why it often feels threatened, how it actually is threatened and what we all can do better to ensure our basic need for safety and security. Jamine Moton is the founder of Skylar Security , a private security company based in Atlanta. Since starting her business in 2014, Skylar Security has emerged as the next generation of security services in metro Atlanta. From client onboarding to contract implementation, the firm focuses on providing unparalleled customer service to clients and their guests, while reflecting the standard of excellence that upholds the brand of each client. Jamine is building a brand aimed at disrupting the security culture by changing how customers are engaged, procured, managed and represented by the officers they call on to protect them. Jamine’s long-term vision for Skylar Security includes incorporating technology offerings to scale Skylar into public and private sector markets throughout the East Coast and ultimately, across the United States. Additionally, Jamine Moton is a Police Officer with the Clayton County Police Department, a graduate of Clemson University with a Master’s Degree in Training and Development and a Bachelor’s Degree in Criminal Justice. 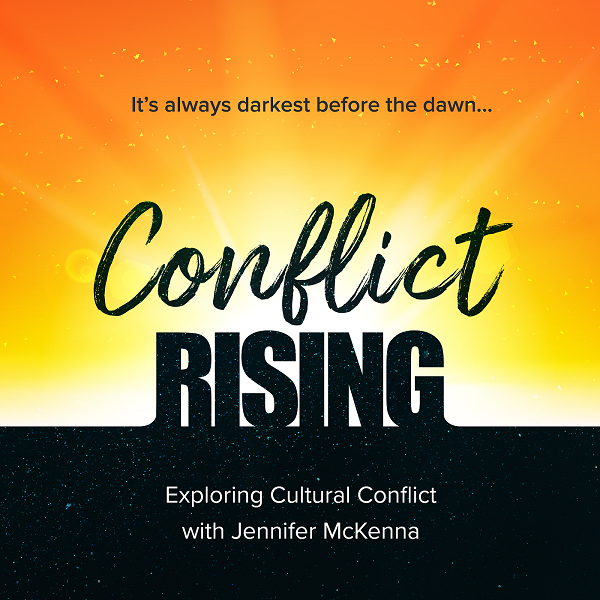 Culture Consultant and JMac Consulting CEO Jennifer McKenna kicks off the premiere episode of Conflict Rising with her Associate and Director of Corporate Communications Rebecca Turk as they share why they wanted to launch this show. Driven by passion and purpose for positive change, these two will share their vision, experiences, and insights about why conflict is playing such a significant role in our culture today – and what we can do about it. Rebecca Turk is a transformational coach and consultant. Certified in the JMac methodology, she specializes in employee cultivation and creating highly engaged workplaces. Her work supports the transformation of employee behavior to ensure brand integrity.